I've made a lot of lengthy trips just to get to food, trips that were made even more complicated by the fact that I live off the G train. But the journey that took me to Lakruwana was by far the longest and most involved trip I've ever made. I'm pretty sure I used every mode of public transportation available in this city-- 2 subways, 1 ferry, 1 bus ride, and 2 legs, I guess. But it really wasn't the huge pain in the neck that I thought it would be. Maybe I'm just getting used to it. Or maybe, after reading Pete Well's review of Lakruwana, I wasn't going to be a whiny baby and let something like public transportation get in the way of me eating this food. It's probably a combination of both. Also, sorry ahead of time for any blurriness, partially due to my sub par phone camera and partially because I was too excited and overwhelmed to care. Starting with the green pile on the right and moving clockwise: chopped and stir fried kale with coconut, an egg (from the egg curry), pork curry which blends in with the deviled chicken, it's hard to tell the difference just by looking. Then there's the green beans, pineapple curry, vegetable fried rice (basmati, of course), and then that heaven in a wafer, made from coconut and rice flour. Pretty sure it's called a "hopper." So crispy, a little sweet, a little savory. I regret only eating a few of those. On Sundays there's an all day buffet. I was a little disappointed to learn that I couldn't order anything off the regular menu because I didn't want my first experience with Sri Lankan food to be lukewarm buffet food. BUT my fears were totally put to rest because this is not your usual line up metal trays full of steamed, soggy food (hi, college). 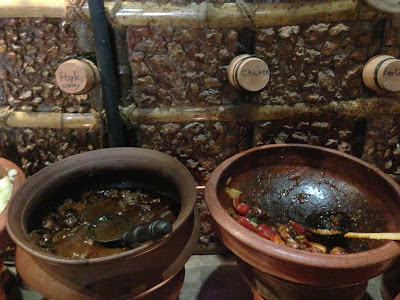 No, no, this buffet serves what seems like an infinite number of dishes in big clay pots over flames. Peeking into each pot was like opening a Christmas gift-- a gift of delicious Sri Lankan food. Actually, everyone, take note. This is what I want for Christmas next year. Yes, that's right, I would like a clay pot buffet. Some beautiful pots not so full of food, but they were re-filled soon after this. But I was too busy eating to get back up and take another picture. I wish that I had though, because as it is right now, this doesn't look totally appetizing. The pork curry flavor was not totally memorable (it sort of had a generic curry powder taste) but the chunks of meat were pretty well cooked, and it was overall, still enjoyable. The deviled chicken was way more delicious though, tender and flavorful, with a little bit of crunch from the bell peppers. The heat from the chiles was HOT, obviously, but I think that I'm getting better at enjoying spicy food without wanting to dunk my tongue in milk. I liked that the more I ate, the more pleasant the spicy tingle became, especially since there was a little bit of sweetness to counter the heat. Yuca! I don't think I've had yucca that many times, or ever, maybe. This was pretty chunky, with big soft blocks of yucca, but it was also partially mashed too, which made for a pretty confusing texture--creamy smooth but also very thick and starchy. It clung to the roof of my mouth, which sounds unpleasant but I enjoyed it. 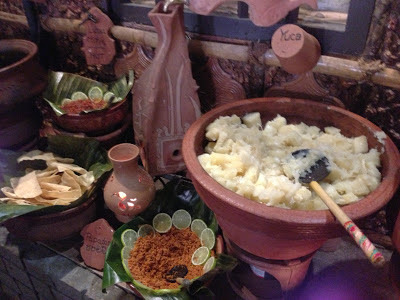 The yuca had a nice, delicate flavor and was a nice contrast to the other spice-y and spicy dishes. A very nice way to temper the burn of anything too intense. This pot looks like something straight out of a kid's Halloween movie. It was the only thing that I didn't feel like trying, but I like hard-boiled eggs, so I went for it. The curry was super mild, and was a nice subtly milky-coconutty addition to my rice, but the egg was just an egg. I wouldn't waste stomach space with more of this. I loved how appetizing this looked-- hearty, yellow, and filling. It wasn't quite as appealing to my tastebuds as it was to my eyes (I thought it was a little boring), but there were nice hints of cinnamon mingling with the creamy coconut milk and lentils. I'd want this on a really cold day. Nice way to jazz up the less flavorful dishes. Haha, "jazz up." What I mean is that this must be the Sriracha of Sri Lankan food. I know I already posted this picture, but I wanted to talk about the kale and the pineapple curry, which is that mustard color pile of sticks right in the middle of the food pile. The kale was delicious, curly and soft without losing the its sturdiness, and rounded out with a toasty milky notes from the coconut. On the other hand, pineapple curry was a little bit spicy and sour, which I think maybe comes from tamarind. I thought it was helpful to have those flavors to create a flavor balance, but cooking the pineapple brought out the natural sugars and made it too sweet for my liking. It was better used as a condiment for the more savory meats. Actually, maybe that's what it was? You'll notice that I didn't go back for the pork, but got more chicken! I also got some eggplants as well, which is that dark brown blob at 9 o'clock. Sticky and sweet, with a slightly bitter after note, the eggplants are basically a chunky mush that you want to stick your face into. This was definitely one of my favorite dishes, and I liked it best with rice or scooped onto a hopper. 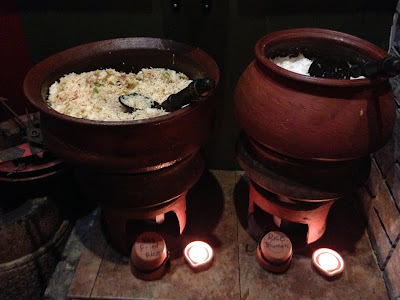 I also really loved the onion sambal, which is that purple-red stringy pile under the hopper. 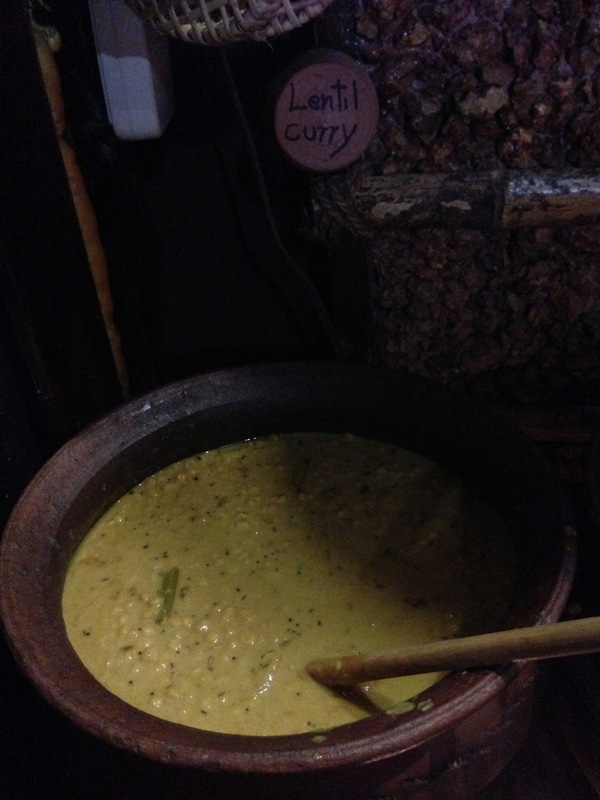 It was a nice tangy condiment to add to the creamier curries and meat. I like mango lassis, They're creamy, thick, sweet and delicous but I should never order one for myself. It's too much for me, but it was nice to take a sip here and there whenever the heat got to be overwhelming. The mango mousse was basically a mango lassi in mousse form, which was enjoyable but I had already overdosed on that. The caramel pudding was a soft and fluffy, laced with nutty flavors and mango sweetness, but not quite the dessert I was looking for. I might have felt differently had I not had that mango lassi. My favorites were the tapioca and especially the yogurt. I like to end my meals on a savory note, but if it has to be sweet, I prefer it to be subtle and in small amounts (I know, this big plate of desserts doesn't count as small). The yogurt totally fit the bill. It's so smooth and creamy, with more tang and sourness than sweet, and when it's topped with that beautiful dark honey, you wanna melt right into it. The honey was luxurious, I almost felt like I could drink it with a straw. I thought it would be nice to end this post with a picture from the ferry, but this is actually us leaving Manhattan, not going towards it. But humor me just this once. This was my first time trying Sri Lankan food, so I can't say how this compares to the "real deal" but I enjoyed it so much. I can't wait to go back. Next time, I'd like to try just a few of the dishes so I can really savor them. Also, that way I won't be too full to try the other Sri Lankan restaurants on Staten Island. I also wanna bring a real camera with me; this is one of the times I really wished that I owned one. Lakruwana is such a beautiful restaurant-- it really transports you, and none of my iPhone pictures do the space or the food any justice. Holla at me if you're down for a 2 hour trip on a Sunday morning. I'll be there!